The Spirit CU800 Commercial Upright Bike is a self-generated light commercial and residential upright bike with incredible features. 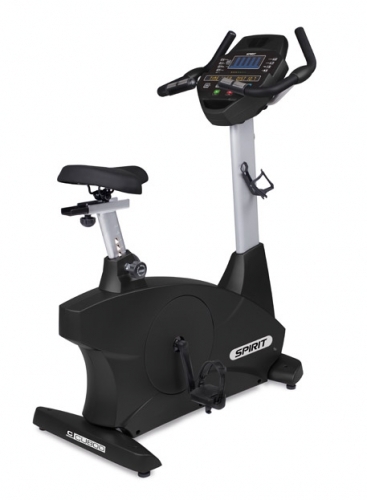 The Spirit CU800 Commercial Upright Bike features a cushioned gel seat with both vertical and horizontal adjustment capability for maximum comfort and ease of use. Durable, comfortable, and smooth are all qualities of the Spirit CU800 Commercial Upright Bike. Easy adjustments, bright LED screens, a turbo cooling fan, high density foam seats, challenging programs, 40 levels of magnetic resistance, and a generator powered console are standard on both models. The Spirit CU800 Commercial Upright Bike was specifically engineered for the commercial environment, from its heavy duty steel frame to its durable powder coat paint finish. The design focuses on convenience, comfort, and durability. The Spirit CU800 Commercial Upright Bike is very appealing to users that value a smooth ride and extensive data feedback. 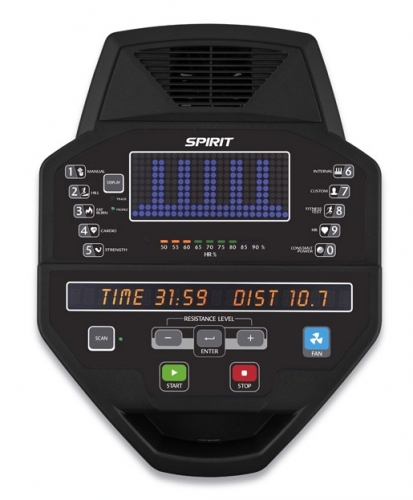 The console is identical to the CR800 fitness bike & CE800 elliptical trainer, which makes programming very familiar when using any Spirit Fitness C series products. Choosing the right piece of exercise equipment is an important investment in your health and should not be taken lightly. Call 1-800-875-9145 and talk with one of our friendly agents at FitnessZone.com to learn more about the Spirit CU800 Commercial Upright Bike and get on the road to smarter and healthier workout results. Order your Spirit CU800 Commercial Upright Bike from FitnessZone.com today and take your workout to a higher level. Cooling fans that swivel are standard on all of our fitnes bikes . This may just be the reason you extend your workout by a few minutes. Order your Spirit CU800 Commercial Upright Bike from FitnessZone.com Today!